As part of the Transforming Infrastructure Performance (TIP) programme, the Infrastructure and Projects Authority (IPA) is establishing a benchmarking methodology that aims to support and encourage more consistent benchmarking across infrastructure projects among both government departments and client organisations. Benchmarking is the process by which the costs, schedule, benefits and performance of a project are evaluated by comparison against a common standard derived from similar projects. The IPA’s approach is based on benchmarking common assets across a range of projects and sectors, applying the TIP principles and using these assets benchmarks to assemble a benchmark for the chosen project. To explore the capabilities of the proposed methodology, in September 2018 the IPA benchmarking team ran a pilot exercise in collaboration with the British Tunnelling Society (BTS). Tunnels were chosen for this exercise as an asset which had both been successfully benchmarked in the past and could effectively and clearly test the IPA’s methodology. Today we have published this work as a case study on GOV.UK. For the exercise, industry stakeholders across multiple sectors came together in a collaborative forum to share information on tunnelling costs. Additional project data was also provided directly from a range of departments, sponsors and programmes which are involved in tunnelling activities. 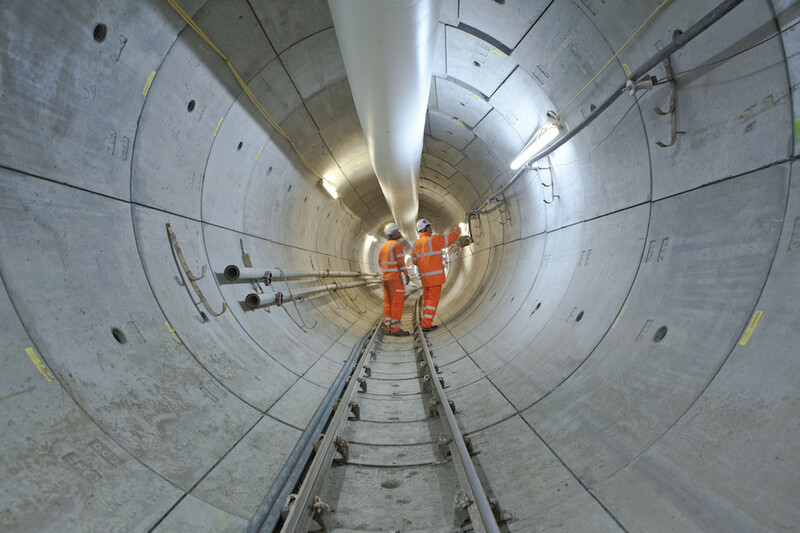 Of the 25 major tunnelling projects identified which have been recently completed in the UK, valid data points were collected for 16 of them. Participants included 11 client organisations including IPA, BTS and the Department for Transport’s (DfT) Transport Infrastructure Efficiency Strategy (TIES) team. The exercise clearly demonstrated that there is an appetite and willingness for data sharing in a collaborative environment between organisations in both the public and private sectors for the purpose of robust benchmarking. 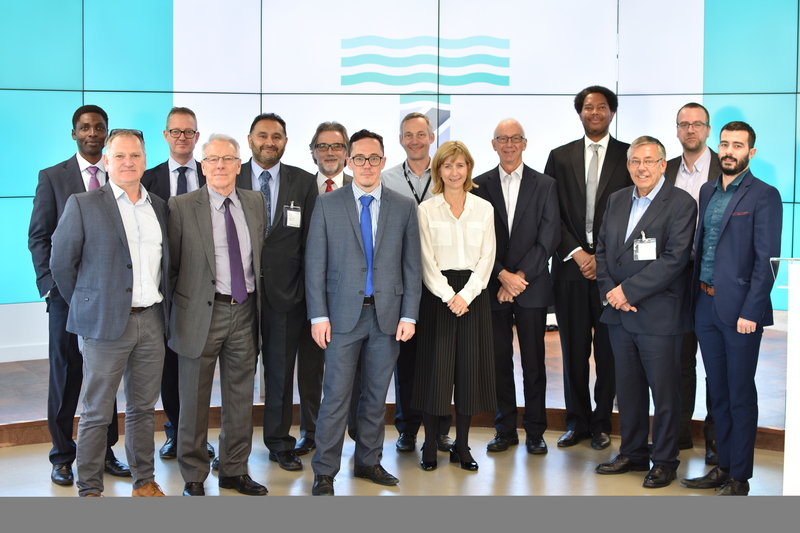 The methodology was well received, and DfT is incorporating the methodology as part of the Transport Infrastructure Efficiency Strategy (TIES) benchmarking initiative. Following the exercise, participants have been able to enhance their own benchmarking and decision making capabilities by enriching the information and analysis provided with their own data. In the future we will look to increase the number of projects that collaborate and provide data and insight to inform decision making and project evaluation. These projects are being sought from international partners, in collaboration with the G20 Global Infrastructure Hub and the Organisation for Economic Co-operation and Development (OECD). 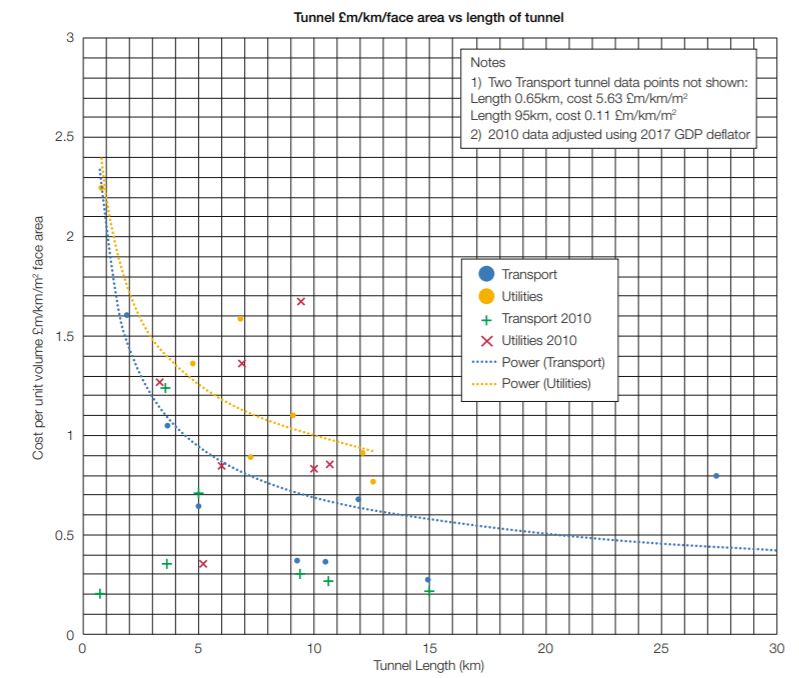 The IPA and BTS were able to undertake a selection of analysis on the dataset, for example the graph below compares tunnelling costs (GBP millions) per km of face area against total length of tunnel. The forum also conducted additional analysis which compared the impact of diameter, volume, tunnel length and production rate on cost. However more data points would be required to produce robust analysis which can be used to support decision making or project evaluation. Given the enthusiastic feedback from participants, the IPA is also looking to support similar exercises in the future and to develop benchmarks which extend across the TIP themes including schedule, benefits and performance. The IPA Benchmarking team welcomes feedback and contributions and is always happy to talk about all things benchmarking. If you have any questions, please contact us via ipa@ipa.gov.uk.